GetSpares was established in 2009 as a women-owned corporation. Employing a staff of sales, business managers, and parts experts, GetSpares is an efficient company, resulting in cost savings for our customers. Personnel includes semiconductor manufacturing veterans with over 140 years of collective experience in the industry. With worldwide sales, quality parts, and inventory availability, GetSpares is a key partner for overcoming production challenges and cost saving benefits. Our customers reach all parts of the globe. 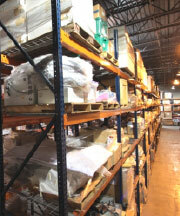 We sell and ship parts proficiently to the Global Market Place.